Will cross with my distance. I know we may be doing the same as a child what they are doing, but being grown we feel these are nuisance. To my knowledge I don’t remember of doing more indiscipline than today’s child are… they are double than us. I have experienced in my apartments while children playing, they give a sudden scream in a high-pitch voice that shock us sometimes happen wrong, and that too sounds like stamp on a parrot. Another is the guest children, who can’t keep quite from taking something that was unknown to them and stubbornness to get on what they see. I won’t tell it’s their natural to behave like indiscipline. It what how they brought up. Giving over indulgence is hiding their disobedient act and without sternness, the parent’s leave the child what ever they do. I remember one of my cousin when he was child throw a pup from upstairs, without realizing that life… ya the pup lose its life. Knowledge of decency is important for children. I notice some children act unusual in public places or in functions like jumping, running, climbing and screaming. It makes us think are they come from some other planets. What makes me feel worry was the words used by some children from very low level up to abuse? Who can we blame for this?… Its parent’s response to teach them how to behave, and its more important to check the surrounding they are practicing. All children are same, the things they learn creates their character. What my thought is the parents much be matured to handle the children and bring them in a good surrounding. The people need to know what to talk and how to behave before children. As grown I may think like knowing all, but children can never be like us. Even I complain about it, I must sense this is the stage for children to scream, fight, play with no expectation to spend their energy. This weekend i had great day with a small get together with my family. My two aunties, cousin sisters, uncles’ kids and with grandpa grandma its a pleasant times for me. Its unexpected that dachu, the little sachin and cos uncle’s kid would present that day and it was the happiest movements in my life. The 7 months old sachin was so sweet and always smiling at me and his little fingers and smooth hair, the soft touch were really welfare. I adored sachin’s smile, crying face, having Cerelac, his activities. This time dachu had a company with another uncle’s daughter Harshu and they were busy with their prank activites and they too have teasing, fighting each other’s, and dachu being senior she try to control her. Having lunch with family and while sharing some comments, and its me to take the kids a round in my power chair. I was my wishing for my grandpa to come that day; it were few months back I met him before he was in treatment at hospital for cardio attack. I must be blessed to be his grandchild who was an understandable grandpa, and he knows whatever i sense. Till evening its full of sounds and enjoyments. Even though all left, my sister was staying and we had a cool time in evening by going out in Gilly (my chair) and she was walking beside me and we were talking about the growing buildings and shared our thoughts about how our place would be in coming days. As I was thinking about living in rural sides and future farming, she matches my thought like how I sense about the western hillside villages that we were traveling through Theni, Dindugal districts last year for the first time. Its long time you know we were going out (while walking and talking), I feel like missing my living in this earth when we couldn’t share our movements and times. 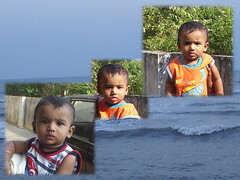 On Sunday we were to Injambakam beach the parallel road to VGP Golden beach, a place that was very clam. We took the gilly and I was riding on the roads with two sides of farmhouses with blooming colorful flowers from the big compounds. Somewhere we could hear some different noise of birds from a big farmhouse. I think this weekend was special to me that was being with family and i expecting more special days in the vocation times of cousins. 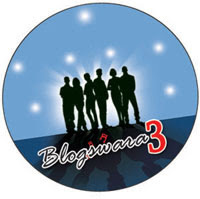 BlogSwara Version 3 the online music album by bloggers has released now earlier, as soon in the times of 3 months gap after the Version 2. For those who don’t know about this, BlogSwara is team of blog mates, who were from different parts of this world, some haven’t even seen each others and every thing where done through internet. It comes out more beautiful and youthfully this time in 3D languages of Tamil, Malayalam and Hindi. All songs were adorable!! And the quality of songs were much good that last versions. Some of it was our Jo’s Malayalam song Kulirolum was very nice with Jo’s vocal and music was perfectly gone. The second one that attracts (my fav) me was the romantic Romeo yen kadhal romeo… wow I admire the voice of Ranjini Vijay and Mux Narasimhan. The Yaaradhu nenjukkul kudivandhadhu… was poetic lyrics. Check the album here as it’s online (its free download also) and don't forget to comment here about your thoughts on the album. I appreciate the effort of the blogswara team that was doing lovely works. Those who are interested in singing this is the best place to expose. If you are interested? Contact the blogwara team and you can get chance in participate in the upcoming more albums. i need a day to thing about you? and enjoying, like its real. In our lives the biggest nature resource “WATER” has an important part to holds our lives. There can be a day without using water…? As today the day of Coping with Water Scarcity declared under the United Nations General Assembly’s World Water Day, I like to write something related to water. If we tell water the first thing comes to our mind is Freshwater that was called drinking water. The Water covers 71% of Earth's surface, and the more quantity is on oceans that non-usable for humans. The except amount of water are useable that we get form, rain, rivers, lakes, groundwater and sea ice known as freshwater. In our human life, we need water to drink as well to food that we get through agriculture. 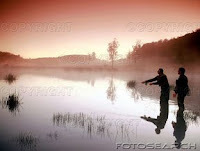 In the freshwater more quantities are spend for agriculture. In the forefront countries India is one among to produce more foods mostly paddy, sugarcane, wheat, pulses, vegetables. In today’s time the agriculture is decreasing because of this water scarcity. Little seasoned rains, Drought Rivers, denial of releasing waters from neighbor states makes the farmers disappoint to do farming. If we put a question what’s the way to get away from this scarcity? All most everyone brings the linking river thought. This was the speech that spreads in this 21’s century, with out finding any sign that it could be possible or not. But the Australia has comes with hope that its possible to link rivers. Water sharing was not only here, but also in Australia were Queens land, Victoria among 6 states has struggle to get their water. Like Karnataka their was this Victoria protest to sharing water, after some talks they got a solution that was linking the rivers and this brought a good farming resource their. There were some ideas to give bye to this scarcity. Can we take this water scarcity is because of climate change and natural disaster? For more than 100 years (I think) we haven’t see such changes in nature that was over drought and over floods. Now what can we expect (that are already in process) is rainwater harvesting by collecting every drop of rain. This is one of the best idea that not all are using it properly. In some of the developing countries the raining is variable and the raining days are little. In India 50 percent of raining days are minimum 15-20 days or less than 150 hours out of 8,760 hours a year. This varies in other regions like more than 150 days in northeast and less than 10 days in western region with 14,000 millimeters of highest annual rainfall in Cherrapunji. With this condition, water for drinking and water for irrigation brings difficulties between people. In this water harvesting, the villagers can be the first and easy going with this technology. What farmers and village administration need is to come out with a plan to use the remote sensing technologies to locate natural underground dykes were they can able to holding the little rainwater in like small check dams that allows it to seep underground and recharge the groundwater. This technology will work for other parts of the country (with variable rainfall) or not, this would work well with Tamil Nadu. Instead exploit of rivers and dams, which are the key source of supply. With this harvesting even after two years of poor rainfall and backbreaking drought, it will help villages to withstand the worst. Water in rivers and aquifers is only a small portion of total rainwater availability. Dependence on them alone can lead to an unbearable stress on such sources. This technology was successfully with in a village in Gujarat, since back in 1985 over 45-check dams in an area of over 1,000 hectares. With this and the latest new way of irrigation has introduced in some villages in South India gives hand to produce more with little waters. The drip irrigation enabled farmers in these villages to earn more and also increase the area under irrigation by using the water they saved. 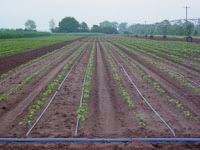 Drip irrigation, also known as micro irrigation is an method that applies water slowly to the roots of plants, by depositing the water either on the soil surface or directly to the root zone, through a network of valves, tubing, with the goal of minimizing water and fertilizer usage. 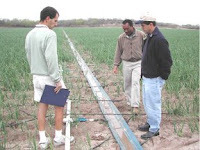 Drip irrigation has been used since ancient times, but modern drip irrigation has become the most important innovation in agriculture since the invention in the 1930’s, which replaced wasteful flood irrigation. It may cost more for the poor farmers to process this Drip irrigation, it hopes if this irrigation spreads everywhere we can easily free from water scarcity. Except paddy, this irrigation is used extensively in areas of water scarcity and especially for crops such as sugarcane, grapes, coconuts, cotton, groundnut and other vegetables and flowers. If India wants to become a developed country we need to increase the agricultural production, so we have to bring a proper water supply and storage as well we should realize the important of freshwater and bring thrift proceedings. By mid night story talking. Me talking with old memories. You my best friend, why this solitude stage. It’s really a great disappointment for Indian people, on Saturday night, (whom where in the dreams of world cup) where the B section India lost to our neighbor country Bangladesh in 5-wicket difference in the World Cup Series. What sad us was the deceit of losing 5 wickets below 20 minutes. Because of this the cricket fans in India were in seethe and involving in protest; burning and stone throwing on players house. I feel their sense and the love they kept on cricket, but involving in violence must be contempt. But who would be response for a citizen of Gujarat who died in cardioid attack, after seeing that India defeat? After all it’s a game, losing and gaining are normal. When our team wins, we all enjoy; when they lost why are we not with them. If we itself protest against them, then who will support them. India’s sorrowful bating, have meager the hope between fans of winning the world cup. That’s not the final match is it; we have another chance today to face the challenge against Bermuda. We can hope this time they will score more, but India needs more concentration and practice to face Sri Lanka to enter Super Eights. Between Ganguly’s fans were not in this protest and praising his 66 runs to declare he is the true champion. Cheers Indian Team!! Don't loss hope. Words silence when their gesture speaks. This post is out of rules, which was to grab the closest book and write the 5th sentence from page 123. Here is an info tag post. I present this post (tag) to my friend Kay, where he tagged me. Nowadays, when we want to communicate, we either email the person or SMS them. Everything happens at the click of a mouse or the pressing of few buttons. But in the olden days it was not so. At one time, if we wanted to mail a letter, we wrote the letter, put it in an envelope, stamped the envelope and dropped it in a post box. After that it was the postman's job. But in the 1850s for people in America to communicate to someone in the west, their letters went by overland coach and usually took weeks to get there. One enterprising freight company decided to speed things up by hiring 80 men to take the mail to the west on horseback. In 1860, the Pony Express was formed. The riders for the Pony Express were chosen for their lightweight as well as their riding ability. Most of them were young boys. The route they undertook was a rugged one; it went from St. Joseph Missouri to Sacramento, California, a distance of over 1,800 miles! Each rider rode a total of 75 miles, changing ponies at stations posted at ten-mile intervals. The mail was carried in four leather boxes, which were attached to a special saddle blanket, thrown over the saddle. The changing of ponies was done in two minutes. The speed was a bonus, because it cut the average delivery time from several weeks to about 10 days. The fastest trip was made in seven days and 17 hours. This record was set by the rider carrying President Abraham Lincoln's first message to Congress. The poor riders had to ride through unknown terrain; some routes exposed them to attacks from Red Indians and led them through dangerous territories. For all this dangerous work they received decent salaries of $25 per week. 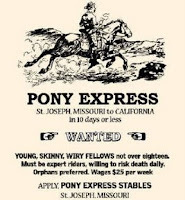 Newspaper ads for riders listed one important requirement orphans preferred. Though exciting, the pony express was a short-lived experiment. It lasted for only 19 months. By then, from coast to coast there was a telegraph line and this was definitely a faster way to send messages. We sure live in better times. Just imagine waiting for a fortnight or more for a message to reach a dear one and another fortnight for their answer to reach us. Aren't we just grateful for all the technological developments and latest means of communications? 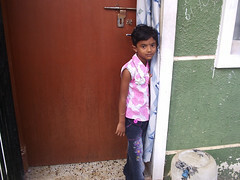 This is my uncle’s daughter Dharshini, she was visiting my house gone weekend. I am seeing her after few months, as she we in her grandma house. 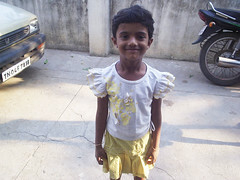 In this few months she has grown well and become sister for a 6 month-old boy Sachin. It was a happy surprise that I couldn’t expect she would be visiting our house. I heard that she was keeping her bro on her lap and singing Munba va song… and recent news from her was, she won 1st prize in running race. 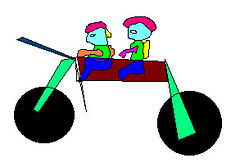 U could see her drawing above like she and her bro was riding bike. It’s been six years since I have went to a night show Film in Drive-in. Last time it was Arjun’s Vedam in 2001 with my uncle, it was the last film I watched with him, before he pass away. I couldn’t avoid those memorial days with him, when standing on the long line to enter inside the theater. Whenever we visit our grandpa house, my uncle used to take us to night show in drive-in, those times it was very very enjoyable to go there (not only to watch films, but also to play in the sea-saw, sliding tree, swings. Washing faces, powdering and shouting prathana, prathana… is still funny days. Thinking why this long line today only, may be it would be the first time so much vehicle for a film, where the hero is new face!! The hero is Karthik, brother of actor surya and son of Shivakumar. The Film is Paruthi Veeran (Cotton Hero :D). Films comes sometimes to screen with indicating the acting, not on the story or for the hero, Paruti Veeran is such a film. Director Amir created the whole film, whose film Raam won the international award, after years… I watched the both film this weekend. The story is the hero Veeran is a person always doing some criminal activities with his uncle Chevvazhai and they were roaming without any ambition and going to jail is there habit. Here the heroin Muthazhagu was affectionate on the Veeran , (who is her aunty’s daughter where the both families were separated for an caste difference), but he avoid her till a situation comes to him to understand how deep she loves him… what ever happen then are said with brave and inducement. The Film starts with a big rural festival, were all sorts of rural dance, music and shops presents gives very good feel and keeps us energetic to see that today a movie with full rural style. For me the strongest characters are four, the hero Karthik, heroin Priyamani, music and cinematographic. Should tell about the Karthik, who has a mixed face of his bro and father, which comes as a very different and looks like a real gallantry village boy. He and his cittappu (uncle) Chevvazhai are very merry persons, drinking, and doing all ridicule activates, in this the person who always loss something is the KanjaKaruppu (the comedian). The police station scenes and the photo shoot with knifes were funny, and the hero’s main aim was to do big crime and to visit Chennai Jail, and giving interview. I have to tell about priyamani, I haven’t seen any films of her, she was very different; has a talented acting and her expressions are really superb. She done a bold acting and the climax was very rude and violate. About the music, it has a sense of rural fragrance. The two folk songs were energetic, what I think special about it was, the songs were singed and acted by real rural artist. The Sari gama Patahani was fine, and the voice given to it was very sweet and the Iyyai Iyyao song was lovely for not only the music, and too for picturesque. The song Ariyadha Vayasu by Ilayaraja was nice and looks beautiful with the kids love. I am recommending the music director Yuvan should be praised by state award for using the rural involvement in his music. No w coming to the cinematographic, the cameraman Ramji's shows the remote places that hopes, which were new to cameras. The sunlight behind the hills and the sand lake, the dry grasslands and the festival gives tremendous about the Madhurai sides. I could tell, we couldn’t expect a different story or a message in this film… but a different acting and the bravery of the character and speaking dialogue. India will fulfill its 24 years dream!! I don’t have a big craze on cricket, but when it comes to World Cup I am with my nation, which was very crazy on cricket. Everyone is getting ready to the enjoyment in fun of sun sand and cricket on the Caribbean islands from 13th. Indians across all age groups are getting ready with a special preparation to watch the game that would start only at night, IST, given the time difference. And also exams time here, with the world cup fever. It would be a difficult situation for the parents to divert their children’s attending on studies than cricket. The other day the Indian cricket team left to the Caribbean Islands, with great expectations and billion prayers of our fans. Making the team India for world cup 2007, the biggest World Cup since the first edition in 1975, it is being held for the first time in the West Indies is a story in itself. For almost two years, our Indian players were observed, tested, branded, discarded and reinstated before the selection jotted down the final fifteen. Dressed in newly designed sky blue outfits are all set to launch a fresh onslaught for the coveted trophy, after being put through a painful and sometimes logic-defying churning. This time around team India is a blend of experience and naiveté with the scale tilting heavily towards the former. Of course, the core of the team is made up of battle-scarred commanders, with the big three of Indian cricket Tendulkar, Ganguly and my fav Rahul Dravid forming the batting mainstay with the talented Yuvraj singh, Sehwag, Anil Kumble, Zaheer khan, and youngsters like Dinesh karthik, M.S.Dhoni, Sreesanth, Ifran Pathan and more… Experiment and flexibility have been the password for success in the Greg Chappel-Rahul Dravid period; now it is time for the players to settle down in specific roles. Each one has a clear-cut job profile, with no scope for ambiguity or job duplication. Seven batsmen, seven bowlers and a wicket keeper who can also bat. Will they cross the finishing line ahead in the rest of the field? Let we all wish them to Won the big cup. Cheers Indian team! along with loved ones, while playing the dice. now all somewhere, in different thoughts…. Wait! a single word, makes us so astonishment when we get a good thing from it. We all wait for some thing in some situation to be done or to be come. Wait is one of the word I use often. Many thoughts were running with me when I read a post about wait in my mate priya's blog. Waiting is welfare; it gives happiness, but some waiting is stress. I like to share the stress and happiness of my life, I face through waiting. When it comes as a student, I used to wait, when will the last bell will ring? to get away from the class and to go home (ya many used to do the same na); but I had a very difficult waiting that I haven’t expressed to anyone. Its suppress of my filled bladder, what can I do, and to whom can I ask to take me to bathroom, that’s not a easy thing I know. So should have to wait till my parents pick me to home, I have face many days like this in my school time. This wait is what I couldn’t forget and wish this type of wait should never come again. Cloudy sky which without any sign it makes to wait, till the drops touch the land, mom used to tell its like rain coming, come in, but I wait for the rain and it’s a small joy to see the rain coming. While playing run and catches with friend, waits comes to escape from the catcher. When there was no traffic police, some crosses the signal before the countdown finish, but I am very strict toward me to wait till all numbers finish. In traffic jams, the vehicles used to cross cut and go front, but this way is what I hate, whatever important can it be, I like to wait and go in line. Every minute of the days waiting for my new cycle to arrive is what a happy movement with minds thinking about the new cycle, how to drive, were to drive and imagination is what we couldn’t avoid, the inside happiness is what we wont get it again like our first cycle. Waiting for the bench end mate kavitha to talk with me, she talk very sweet with me, I have waited for three years to get a place to sit near here, but I dint get it:(. If sometimes my parents come to pick me late, she used to wait for me to go, that times I pray that my parents should come late, so I can talk with her. It was times from 6th to 8th Std. I am waiting for a very long time, to get a friend, who can rub my should to touch and hug me. I am not feeling any wrong about all my friends here, you are the only solace and support I get in my life, but u see above all we are just sharing through words and I am just sharing my experience with my life and family. Have I every said about my experience of being with a friend, going out with them like beach, films, outing? Many were having friends through or from their school days to collage, office days. Even elders have friend to share in personal, u could see many elders would sit in beach with friend and laugh and enjoy the movement. When all have why not me? with the hope I am waiting for a mate who can be with in my life to share my though, views and happy movements, and also express theirs with me. That’s not like a friend being with me always, it can be some hours in a weekends to share with me. I am waiting for many to be get….with a hope. Tomorrow is March 8th Women’s day. In today’s time, women’s are achieving equally to men’s, so we should be proud about our women’s who were big achievers in our word, and also in space. By celebrating this day we are encouraging many women’s to achieve more. 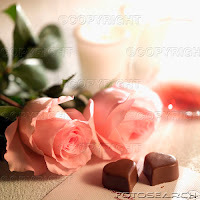 I wish u all a Happy Women’s Day. These days I was going on our streets in my power chair; I have a great feel riding on my own. Once a shy person, resist going out in the wheel chair, was now feel like left the shyness and live for his happiness. I can find many stand and watch me going on the chair on my own, but I didn’t care about others, because I am here for my happiness. Saturday was my first attempt to going for beach in my chair. It’s a km from my home, but seeing the traffic of heavy vehicles in ECR, crossing the road was very hard especially in evenings, so we detach the chair and took it in the car. The beach was crowd less, we fixed the char and I started to drive. It’s my wish to walk like others on the beach road, but at least if I can’t walk I could move with my chair, instead of sitting inside the car. I experience the sea breeze fully after some years, while riding. Every time dad leaves me in the car and go a walk, this time I was with him and also mom. Actually they were walking behind, and I was faster than them, a long drive. I haven’t expected that my chair can handle any type of roads, it’s very powerful to climb big crest. I have given a name for my chair, its Gilly. It was special day too of full moon above the sea; the moon’s reflection on the water with the shadow of the standing boat was an awesome scene, to my bad time I left my camera in the home, so couldn’t capture that beauty. 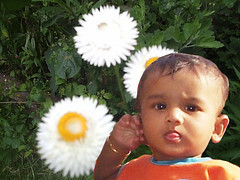 There was a new program in Suntv its totally enjoyable. U guessed it right; its Asathapovathu yaaru a comedy show presented my new faces, this program was like Kalakkapovathu yaaru in Vijay TV. What a show, its amazing to see how talented these people are to make every one to adore. This guy kovai guna was very humorous with his knowledge and performing way he makes us laugh and think. This is a program I am enjoying while watching with dad and mom. 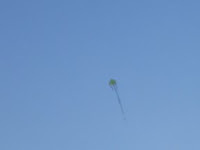 Pic was a flying kite in the sky. Took last week. Dogs are big threatening nowadays!! When it comes to dogs, we know they are grateful and express love on those who cares them well. But today’s some (I think more) dogs are not like that, or we can tell they changed their habit to taste the flesh of children. 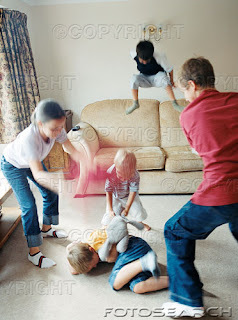 Now a situation was created against the children, and parents were in fear to leave their children to play outside their home, what they usual do. The reason for the fear is the recent incidents of dog’s biting on playing kids. The dog biting comes to light when a 6-year-old Nagarajan, from Nilagiri distric of Tamil Nadu, was bitien by 20 madness dog’s in 100 places on his body when he was playing ball with his friends. To my memory this is the first cruel incident I heard about dog’s madness on human. With in 30 days of time another incident was happen in Thiruvannamalai distric of Tamil Nadu a 1-year-old child was lost her life to the dogs. 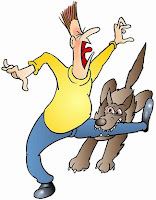 Before we think that dog’s much ado are only excess in Tamil Nadu, but the objection comes from the metropolis and IT-hub Bangalore, that we too faces the dog bites! Coming to the matter, today’s news in papers lifts everyone’s eyebrows that Manjunath a 5-year-old little boy was mauled to death by a group of 15 dogs in Bangalore. The incident happed when the boy was playing hide and seek with friends, near his residential colony. There were 15 madness street dogs in the place where he was hiding, and what to tell? It’s proper time for dogs to show their madness on the boy who caught alone. 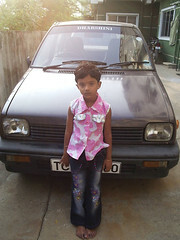 This is second incident in 2 month of gap when street dogs killed an 11-year-old Sridevi in the same Banglore. There is nothing like another state or another incident outside our boarder. It may even happed in our state, city and street, at least after seeing these incidents the government (the only one where we can complain) who keep the promise of abolish dogs in our area in their election propaganda, should care on people to stop further dog bites. Some years back, the dogs used to roaming with a metal dollar in their neck, which is said to be the licence given my government to kept dog’s as their pet and those who have dogs with out licence have been fined. But today, I can’t even see the indication of any thing like that. We don’t even know still that law is in force or not. My wish is the law should come again to fore with adding more conserve. Near our apartment there are many dogs roaming on the streets and some times they enter inside the apartment. U already know there are much little kids in our apartment and all used to play in the evenings, after reading these news, without my knowledge I feel worry about the situation here. 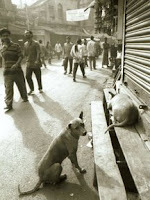 Before any thing seriously happens, the government must take some steps to control the dogs. Was thinking what to write today here and in a hope that i will get something to write, I started to read some blogs and priya’s timing post makes to scribble. I think myself that I really enjoying or going with the life as it goes or just living with timing. My everyday activities are with timing, from early morning to late night. This timing disturbed even many of my dreams and imagination. If I was in some other work and sudden imagination of some think crosses, I go with it and forget the current work and miss the timing, which makes me feel sad, some times anger too. Because of timing I get misunderstand with cousins sometimes and I sense that I only concentrate on my work and timing and to forget spending with them. If I were to cross my early day activities by taking that time to seep without my knowledge, it confuses that day’s activities and without any idea which one (activity) to cut to adjust the timing. On Sundays many of them leave that day as it goes and be free with out any work or timing tension. But this fellow will not even leave this Sunday to insert the timing. My thought for timing is, it gives sprightly clarity of mind; another thing to be with timing is to avoid any recede in activities or creating laziness. In another point of my views is that going with times would bring some other symptoms in the health or this sprightly day time activities may be the reason for sleeping morning times? Am I missing the joys, which can experience in this stage of life only? If I was going with my own wishes and joys with the freedom I got (no one to question me, even I sleep or watch TV for all days with out knowing what is happening around me); and the day if I dint sense to realize that time was running and I am being like a dump; sure I won’t be entering into this net world to know u all. For these changes, I agree with my timing way of living.